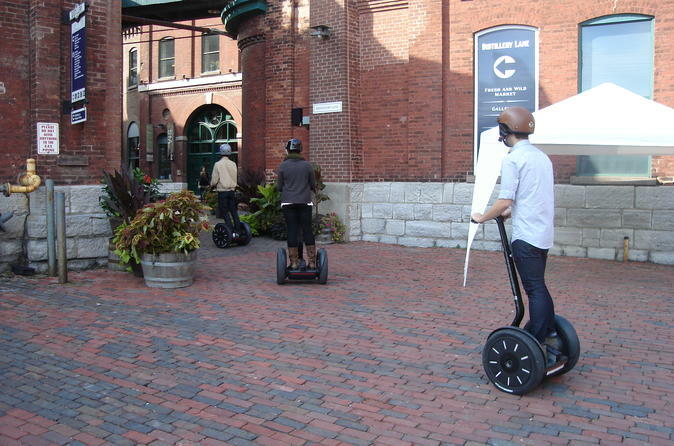 This 1-hour Segway tour is packed with awesome facts and a fun ride around Toronto's Distillery District. Enjoy more historical exploits, riding time and a complimentary tasting at two favorite Distillery District businesses. On the tour, you'll learn about the rise of a booze empire, Toronto's drunk history, and many other incredible facts that will leave you awestruck at Canada's vibrant history. This tour is perfect for beginners and first-time riders. Make your way to Toronto's Distillery Historic District, where the tour will begin with a brief training and practice session on the Segway. Once you've passed training, the professional guides will lead lead the way through the neighborhood, sharing stories along the way. During the tour, you'll see the gorgeous Victorian Industrial architecture that defines the Distillery Historic District, and hear tales of intrigue from the area's gritty, boozy past. Pause to visit SOMA Chocolatemaker and the Mill Street Brewery to sample their locally-made treats, then wrap up the tour at your original departure point.